Gabrielle Flinn from RSPB will deliver this Aberdeen Entomological Club seminar entitled “Rare invertebrates in the Cairngorms project: one year on”. It will be held at the James Hutton Institute in Aberdeen (and screened to the Institute’s Dundee site). Gabrielle Flinn is the Project Officer for the Rare Invertebrates in the Cairngorms partnership project. 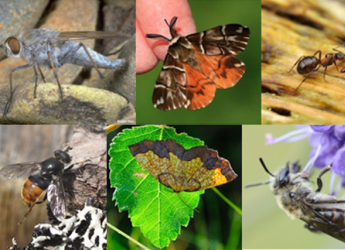 RSPB, Cairngorms National Park Authority, Butterfly Conservation, Buglife and SNH have partnered up to try and secure the future of six rare invertebrates in the Cairngorms National Park. This three year project will try to understand the distribution of Kentish glory (Endromis versicolor), dark bordered beauty moth (Epione vespertaria), Northern silver stiletto fly (Spiriverpa lunulata), pine hoverfly (Blera fallax), small scabious mining bee (Andrena marginata) and shining guest ant (Formicoxenus nitidulus). By building a better idea of the key sites for these species’ and establishing important relationships with landowners they hope to improve their ability to conserve these rare and endangered species. Gabrielle will be speaking about the species in the project and the successes of the first year.